Once regarded as a very useful mineral capable of adding insulation and fire resistance to all kinds of building materials, asbestos is now considered a significant danger to human health. If asbestos fibers from building materials get into the indoor air, building occupants can breathe them in and potentially suffer fatal lung problems. If you want to protect your family from the consequences of asbestos contamination, some form of asbestos abatement in La Verne CA will be needed. How Do I Know If Need Asbestos Abatement in La Verne CA? Once an asbestos-containing material has been identified, you need to examine it for signs of wear and damage. While intact materials typically do not pose high risk of contamination, damaged materials do pose health risks and should be addressed as soon as possible with asbestos abatement in La Verne CA. Encapsulation: This method of asbestos abatement prevents fiber release by covering all of a material’s exposed surfaces with a sealant. This method works well for asbestos floor tiles, but not for asbestos ceilings. Enclosure: This method involves leaving the asbestos-containing materials in place within a newly built airtight enclosure such as a drop ceiling or a false wall. All of our workers are highly trained and conscientious about safety on the job. Our conscientiousness means you never have to worry about our asbestos removal services leaving any dust behind. If you need to get asbestos testing after the abatement project is complete, don’t worry–we won’t leave any contamination behind that could interfere with you receiving your reoccupancy permit. We have served many commercial clients without issue. 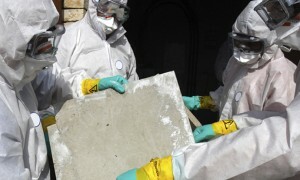 Want to learn more about asbestos abatement options for your specific property? call us at 800-481-8080 to discuss your project and receive a free quote. Our asbestos removal office for Asbestos Abatement in La Verne CA is open Monday through Friday between 8:00 AM and 5:00 PM and closed for lunch from noon to 1:00 PM. With advance notice, projects can be scheduled for weekends, early mornings and evenings.